Between PlayStation Vue, Sling TV and fuboTV, which is the better streaming service for residents in the United States? The short answer is it depends on you. Each streaming service is different in many ways. Not every streaming service offers the same channels. Some offer DVR functionality, some do not. The pricing is different with each one, and each of them offers different special offers. So, at the end of the day, it all depends what you and your family or partner wants or needs. To make the process easier, we’ve compiled the most up-to-date listing of all of the features and functionality offered by the three leading streaming providers that we recommend in the United States — PS VUE, Sling TV and fuboTV. We haven’t included YouTube TV or Hulu Live. N/A N/A Add-on packages available for comedy, kids, news, lifestyle, and many more. As you can see from the list above, the choices are almost endless. Sling TV has been around the longest, and while the amount of channels available is lengthy, sometimes all of the different packages and options can be confusing. And fuboTV, while not having the ESPN channels, offers the most cost-effective option for many consumers (again depending on what channels you want). If you have any questions about the comparison guide, please let us know in the comments section below. What leads you to believe PS Vue is in free-fall and unworthy of inclusion? Depending on what you’re looking for it can still be the best value for money. Dropping BeIn Sports though is obviously a big negative for soccer fans. In the past several months, Vue has lost all of the Viacom channels, had all of the beIN SPORTS channels removed because Sony was unwilling to pay the going rate that all of the other streaming companies are paying, and has also increased the prices by $10/month (as well as removing the cheapest packages). With all of this happening, they’re losing subscribers at a rapid pace, which is why I mentioned they’re in a free-fall. Yes, loosing BeIn was a blow and the $10 price hike which doesn’t affect me for 3 months, but the fact that I still get HBO 1 and Showtime 1 at not extra charge is huge. Direct tv now with Fubo tv is what I got the only channel I dont get is ESPN Deportes . But FOX Deportes and Fox Soccer + guess kinda make up for it. My suggestion if go with Sling Orange & Blue with $5 spanish channel add on. For soccer of course idk I might switch back to Sling. I’m also still with PS Vue, and I have to admit that before the loss of beIN they had everything I needed (other than NHL Network), but with beIN being a big part of my viewing schedule, I’ll have to make some changes come mid-August. PS Vue has gone downhill with their poor customer service and relations, but they still have the most reliable DVR, which is a huge thing when you are fan of many soccer leagues. Now I’m looking at fubo tv, and they have the content I need, but with the DVR limit and how you can watch it, I don’t know if it would work out for me. I know that they recently received a big cash injection so more things are coming probably but just not sure what or when. The most frustrating thing about these OTT providers is that you never know what’s coming down the line, whether good or bad. You normally find out as it is implemented. With so much soccer on fubo, it would be nice to find out what changes we can expect to see in the next month or two. Would be good to know which of the services offer logins to the different channels’ apps. For instance, I believe Sling doesn’t let you log in to the NBC Sports app. Hi Rick, thanks for the suggestion. I’ve now updated the comparison guide to include a list of the sites that the streaming providers include access to (i.e. TV Everywhere apps). Another thing to keep in mind is that FuboTV’s DVR isn’t available on all platforms (Roku for example). That’s one of the factors keeping me with Sling. That and access to the ESPN networks. Just discovered this during my free trail. Bummer. Fubo TV added support to NBC sports app (Comes under activation list of providers) but that is now not as good as before because you still need to buy the NBC Sports Pass if you want to watch all EPL games live and on demand, is that right? The sports package on SlingTV is now $10 a month. Also includes NFL Redzone..
DVR matches from fuboTV is not available on the Apple TV either. To not have this feature available to popular media boxes is a glaring omission. While having authentication to the NBC sports app is nice for fuboTV subscribers, the sports pass requires another app… meaning yet another platform. 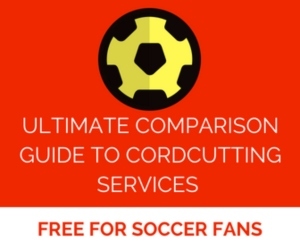 For subscribers only interested in soccer channels it would be good to show which leagues (EPL, Bundesliga, La Liga, Serie A, etc) each service carries and the cost comparison among them. For instance, if I’m only interested in EPL, La Liga and Serie A what would it cost on each service and the tier one should get. Also, how reliable and what is the quality of each service. Does fubo Latino subscription also include DVR? Is Vue in “free fall”? I switched from Sling Orange and Blue because it was cheaper and had more of what I needed, but I will probably switch in November when Vue raises the prices. Apparently, I will have to pay $50 this season for the new NBC Premier League Pass to get what Vue offered. I am accustomed to paying for MLB, NBA and NBA passes each season, so this does not bother me. One commenter noted that the price for these services is close to a cable subscription. I actually have cable sitting on the floor unconnected because it gives me cheaper internet, but I wish I could buy only what I want to watch: your lists of channels for each service is not the analysis I value; navigating through dozens of channels I will never watch is an annoyance. 2 seconds after posting this I found an answer to my own question. DirectTV Now carries Altitude. I’ll give it a trial. Hey Tom. Can I ask you where you heard that DirecTV Now carries Altitude? I just checked with a representative and took a peek at their available regional sports networks (see: http://www.directv.com/DTVAPP/packProg/attLocalChannels.jsp?assetId=att_cms_local_channels&_requestid=2711973). Both indicated DirecTV Now does not carry Altitude. Is it possible to do a similar comparison among available services in Canada? It seems to me we don’t have so many choices here: beinSports, fuboTV, perhaps DAZN. The worst is that the Premier League rights are owned by Sportsnet and their streaming service does not seem to be good. Hi Harry, we’d love to do a comparison guide for Canada, but we have enough on our hands just trying to keep the US comparison guides updated (they keep on changing each week as we new channels are added or removed). Hello, the packs have mismatched prices. For example, it should be Sling Orange and Blue / FuboTV Premier / DIrecTV Now Live A Little, which cost US$ 35-40 per month. What about the rights for Argentina’s new “SuperLiga”? I have tried Sling en Español and it doesn’t carry it. But it does include World Cup classification. Most of the games are on TyC Sports, which is available through fuboTV. Is there a streaming service that has fox, cbs for nfl games and abc, ESPN, fox, cbs for college football. I recently did sling. First I did the combo trial and now I’m on the first month but I’m trying to decide or debate to stay or if not other options too. Fox and abc are just the two hardest to put on. Hi Adam, based on what you’re looking for, you may want to try PlayStation Vue. Dear Chris, this page should be linked at the Streaming section of the menu bar, rather than the February 2015 comparison page. It’s worth noting that Fubo works on A Chromebook – Sling and DirecTV Now do not. Also, Fubo has the expanded DVR feature for 500 hours for $9.99 and Fubo has an Android TV app. Does anyone know If the new Apple TV has the beIN connect app and/or Fox soccer match pass? I am looking at getting one and am not sure weather to buy fubo tv or fox soccer match pass. If there was a separate app for bein that would make a difference. As far as I know, there is no BeIn connect app for the Apple TV. However, if you go with Fubo premiere, the BeIn connect stations are integrated within the Fubo Apple TV app, so you can watch from there. In my experience, that is a better way to watch the BeIn connect channels. I just checked and FS1 is not available in any DirectTV Now packages. This is important for MLB playoffs. Need to verify all of the channels listed as available in this article. DirectTV now still doesn’t have DVR capability yet (again just checked). Hi Jeff, FS1 is available according to DIRECTV NOW (see their channel lineups listed at http://cdn.directv.com/content/dam/dtv/gmott/html/compare-packages-account.html). Also, DVR functionality was supposed to be available in late 2017, but it’ll be available in early 2018 instead. Thanks for the guide. The way I’ve personally been going for the last year or so is SlingTV Blue package ($25/mo), gets me NBCSN for the EPL and FS1 for Bundesliga and some Champions League games. Lacking ESPN means I miss many MLS and some Champions League games, but I have settled for this as usually somebody else has ESPN, if I were really desperate for MLS acccess I would probably just pay for MLS Live. And I know, sponsored data is evil and what-not… but Verizon’s Go90 ($free) gives access to BeIn and GolTV broadcasts of La Liga, Serie A, and Ligue 1, Liga MX, as well as Portugese, Brazilian, and I believe Argentine and Paraguay leagues too. Throw my Moto Mod projector on my phone and boom 60+inch tv anywhere mobile with or without wifi because it doesn’t go against your data plan (cringe I know). An update on these streaming services before the start of the 2018-9 season would be welcomed. Most definitely! We’re waiting for a few of the TV rights to be confirmed for the 2018/19 season such as Serie A and the FA Cup, which are no longer with beIN SPORTS and FOX. Is it confirmed that beIN has passed on the rights for Serie A? (Would not be surprised if so since the FA Cup rights are tied with them). Any additional updates? 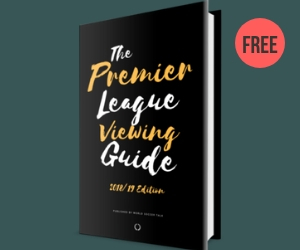 Interested in Premier League and Bundesliga. Still available on fubuTV and Sling Blue? fuboTV and Sling Blue still offer the Bundesliga and Premier League. League Fubo TV Sling Blue Sling Orange B/R ESPN+ etc. I want access to all the Ligue 1 matches, but I don’t want to watch in Spanish. As of right now, the only Sling TV streaming service that includes access to beIN SPORTS Connect is Sling Latino (aka Best of Spanish TV). If you don’t want the Latin channels, you should be able to subscribe to any Sling TV package you want and then add the ‘Best of Spanish TV’ as an additional option, which will provide you with English-language access to all of the games via beIN SPORTS Connect. The stand alone World Sport option on Sling for $10 also included both beIN channels and I’d presume access to beIN Connect. Just learned about this on the ‘ditch Xfinity’ article. I actually just want whatever the cheapest access possible to Ligue 1 games with English commentary. Thank you for the help, all of the streaming options are confusing! Are the Ligue 1 game replays available to watch through beIN SPORTS Connect? Or is it just live streaming only? beIN SPORTS Connect is live streaming only, but if you sign up with fuboTV, you can use their DVR to record the games on beIN SPORTS Connect for later viewing if you can’t watch then live. I have Sling Orange and Blue with the sports add-on which includes beIN English, I am ABLE to stream beIN Sports Connect on my computer through the website using my Sling credentials. I am NOT able to watch it on my android phone or on my Roku device due to “login error”. Does Fubo Latina support SAP broadcasting in English? This is the biggest loss with Sling TV International which I tried first after losing Beinsports on Xfinity. Most of the Beinsports La Liga games are on Bein Espanyol which I used to watch in in English with SAP on Xfinity. I was trying to avoid paying for all of Fubo just to get Beinsports Connect to watch english commentary la liga games, but starting to think there is no cheap option. I am not ready to switch out Xfinity for ATT U-verse which seems to be the only other SAP option. I don’t know of any streaming service that offers SAP. Dear Chris, could you split the master list of channels by genre (terrestrial, sports, news, entertainment, children’s, documentaries)? I’d like to, but I can’t. Sorry. The streaming services are adding so many channels all the time that it would be a lot of work to update the genres every time they change. When Fios temporarily lost beIN I was doing heavy research on the options to potentially replace cable and get all channels needed at the lowest price. Easiest way is to list your must own channels and then look at the services individually and put on a spreadsheet which has them (or if extra cost on one and standard on another). Most are the same with notable differences in whether ABC/NBC etc included and regional sports channels for your area. For me the best combo was YouTube TV and the stand alone Italian package on Sling (RAI and beIN) for a combined $65. Sling lacks a very important regional sports channels and ABC in my market so using it alone not an option, but no one else has beIN. For Fubo Latino? Yes – $17.99/month and no hidden fees. You have to update these to include YouTubeTV, especially since they’re hugely marketed to sports fans (LAfc shirt sponsor, etc). They have all the ESPN channels, FS1 + 2, NBCSN, TNT for Champions League… & about 50 other cable & news channels. Downside: if you don’t live near a big city you won’t get the local affiliate channels, so you have to use antenna for NBC, CBS, ABC, FOX, & CW. I do not see $17.99 Fubu latino only package when I get to fubu webpage.. I see the main options and adding Latino. Any helps is appreciated. fubo Latino has increased to $24.99/month.